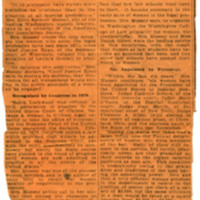 Clipping from the February 12, 1923 issue of the Washington Post. 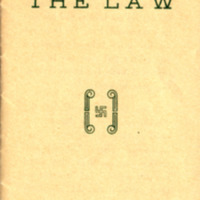 Summarizes an editorial Mussey wrote in the Bar Association Journal on historical discrimination within the legal profession. 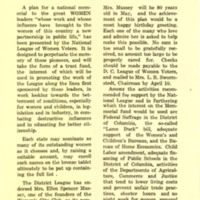 Flyer calling for donations to help get Mussey’s name included on a memorial that the National League of Women Voters was putting together. Reprinted in the Women’s City Bulletin. 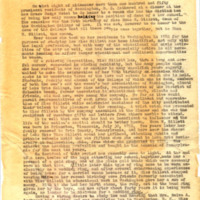 Pro-suffrage speech given by Mussey before Congress in 1910. 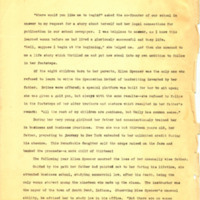 Brief biography of Gillett based upon an interview that the author conducted with her in 1922. Most substantial source of biographical info we have on Gillett. 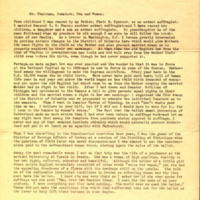 Flyer seeking to raise money for an endowment campaign. Needed to fund a salary for the next Dean. Brief account of Gillett’s life and the tributes given to her at her 70th birthday dinner. Very brief biography of Mussey. 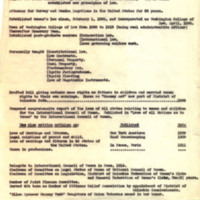 List of various information about Mussey including the classes she taught at WCL, some articles she published, and organizations she was a part of.